Adrian Dingle used the pseudonyms Darian and Jon Darian. I’ve never regretted those exciting days of fantasy. The experience has been most beneficial to me as a painter. We had to draw fast and produce for a tight schedule. While I was endeavoring to pull my weight as Art Director for Bell. I was still writing and drawing four or five strips till the wee small hours. We all had dreams although short-lived. Interviewer: Dave Sim. Now & The Times, 1-2, Oct.1973: 27. Creator of “Nelvana of the Northern Lights”, “The Penguin”, “Sign of Freedom”’ Nils Grant: Private Investigator . Born 4 February 1911 in Barmouth, North Wales he came to Oakville, Ontario with his parents in 1914 at the age of three. He worked in an insurance company in Oakville until about 1930 when he quit his job to study art. In 1931 he took the Ontario College of Art summer course studying under J. W. Beatty who was its founder and a close associate with members of the Group of Seven. From 1935 to 1937 he was in England where he studied at Goldsmith’s College of Art and exhibited at the London Portrait Society while working as an illustrator at Stillwell & Darby. Returning to Canada he regularly exhibited his paintings at the Ontario Society of Artists shows, and sold them through the T. Eaton Company Fine Art Gallery. At the same time, his illustrations were appearing in several magazines including the Standard and Star Weekly. When, World War 2 began. Dingle attempted to join the military but was rejected because of his ear problems. He and several other artists who couldn’t enlist for health reasons organized a large petition volunteering to be war artists. They were more or less ignored probably because there was an abundance of older more experienced artists. . In addition to being the mainstay in the company, for Triumph -Adventure Comics, Adrian as a cartoonist contributed “Nelvana of the Northern Lights”, and a humorous filler called, “The Mums: Maxi and Mini”. He illustrated the stories written by Pat and he drew portraits of military heroes. In a second periodical called Top Flight Comics, Adrian contributed “The Sword Of Destiny”. One can speculate that “Sword of Destiny might have later been resurrected as “Sign of Freedom”. Pat Dingle along with Doris Slater, who appeared in Anglo-American’s Three Aces Comics and Shirly Ley Fortune who worked for Maple Leaf Comics are the only three female contributors to have their names regularly appear in the 1940’s Canadian comics, although in fact in Anglo-American many unacknowledged women were significant contributors to the features produced by that company. In addition to editing, “… we were all doing our own thing right from the start, script and drawings as well. We were at it night and day.” In addition to Nelvana, Dingle created “The Penguin” (which was later named Blue Raven) a crimefighter in a birdlike mask dressed in white tie and tails, “The Sign of Freedom” an RCAF pilot turned underground hero and “Nils Grant Private Investigator”. He also succeeded other artists on “Active Jim”, “Rex Baxter”, “Clift Steele” and “Guy Powers Secret Agent” the last two done under the name Darian. He took on the task of drawing most of the covers either under his own name or under Darian after the principal cover artist Edmond Good left for the U.S. to take over “Scorchy Smith”. When the Canadian industry ended at the end of World War Two, Dingle returned to painting full time. He had carried it on part time even when he was editing and cartooning. 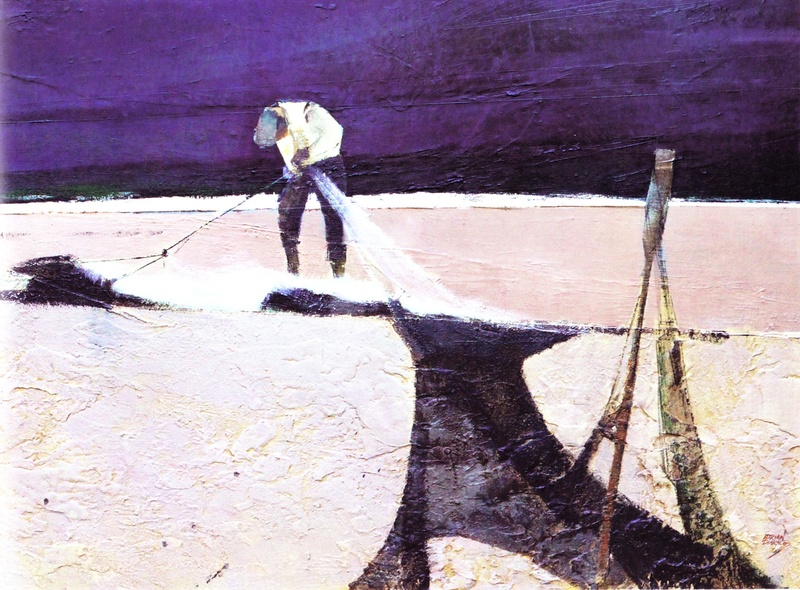 He developed into one of Canada’s foremost landscape and semi-abstract artists travelling and painting in France, Italy, Spain, Portugal, Eire, New England and Canada’s Atlantic provinces until his death in 1974. He taught at the Doon School of Fine Arts. He was elected an associate member of the Royal Canadian Academy in 1948. In 1961 he was awarded a life fellowship in the International Institute of Arts and Letters (F.I.A.L.) . In 1967 he was President of the Ontario Society of Artists. He died from cancer in Erindale Ontario 22 December 1974. Amazing Adventures in the Life Of Nelvana. Bell Features & Publishing Co., no date. Collects stories from the series “Nelvana of the Northern Lights in the Strange Frozen World of Glacia” Triumph Comics, 8 to 12. Apparently the last story “Nelvana and the Death-Dealing Double.” was included in error instead of “Death From Above” the concluding chapter of the “Glacia” series in Triumph Comics, 13. Nelvana of the Northern Lights. Ed., Hope Nicholson & Rachael Richey. Nelvana/LAC, 2014. Collected the complete “Nelvana” serial. “Active Jim.” Active Comics, 12: 10-13. “Active Jim.” Active Comics, 13: 52-54. “Active Jim.” Car., Darian. Active Comics, 14: 53-56. “Active Jim.” Car., unidentified probably Dingle. Active Comics, 15: 33-35. “Active Jim.” Active Comics, 16: 9-11. “Active Jim.” Car., unidentified probably Adrian Dingle. Active Comics, 17: 30-33. “Active Jim.” Active Comics, 18: 44-48. “Active Jim and the Mystery Of The Counterfeit Ten.” Car., Darian. Active Comics,19: 51-55. “Active Jim, Overcoat Racket.” Car., Darian. Active Comics, 21: 54-56. “The Brain.” Indentified as “P and D” probably a collaboration between Adrian & Pat Dingle. Active Comics, 27: 40-45. “The Mums, Maxie and Mini.” Car., Jon Darian. Triumph Adventure Comics, 1-1, Aug.1941. : 17, 50 & 63. 1-4, Nov.1941: 23, 25 & 39. 1-2, Sept. 1941: 30, 40, 63 1-5, Jan.1942: 42. 1-6, Feb. 1942.: 53, (lower half). “Nelvana of the Northern Lights.” Triumph Adventure Comics, l-1, Aug.1941: 18- 35. “Nelvana of the Northern Lights: The Devil Ship.” Triumph Adventure Comics, 1-2, Sept. 1941: 1-14. “Nelvana of the Northern Lights: Cave-in.” Triumph Adventure Comics,l-4, Nov.1941: 40-51. “Nelvana of the Northern Lights: The Battle of the Arctic.” Triumph Adventure Comics, l-5, Jan.1942: 19- 30. 23- 35. After this issue no date is given. internal evidence this is no. 7. “Nelvana of the Northern Lights: In the Strange Frozen World of Glacia.” Triumph Comics, 8:1-12. “Nelvana of the Northern Lights:: In Glacia the Land of Frozen Life.” Triumph Comics ,9: 1- 12. “Nelvana of the Northern Lights: In Glacia World of Ice – Chapter 3,Vultor the Villainous.” Triumph Comics, 10: 1- 12. “Nelvana of the Northern Lights: Chapter 4,Vultor’s Plot.” Triumph Comics, l1:1-12..
“Nelvana of the Northern Lights: In Glacia, Chapter 5, The Unmasked Claw.” Triumph Comics, l2:1-12. “Nelvana of the Northern Lights: In Glacia, Chapter 6, Death from Above.” Triumph Comics, l3: 1- 11. “Nelvana of the Northern Lights.” Triumph Comics, no date. l4: 1- 9. l5: 1- 9. l6:1- 9. l9:1- 7. 20:1-7. 23:1-7. “Nelvana of the Northern Lights.” Super Duper Comics, 3, May 1947. No date given for WOW Comics. “Holy Smokes That’s The Penguin — That Was.” WOW Comics, 19: 1-8. “The Penguin and the Mystery of the Piano Playing Corpse, pt. 1.” WOW Comics, 22: 1-7. “The Penguin and the Case of High Grade Murder.” WOW Comics, 24: 1-7. “The Penguin’s Double Trouble, pt. 2.” WOW Comics, 27: 1-8. “The Penguin, pt. 1.” WOW Comics, 28: 1-7. “The Penguin, pt. 2.” WOW Comics, 29: 6-12. “Sign Of Freedom.” Commando Comics, no date. 5: 11-16. . 12: 29-33 14: 43-48. 16: 48-53. 17: 34-39. 18: 51-56. “’Scoop’ Hilton.” Car., Unidentified probably Adrian Dingle. Active Comics, 27: 46-51. Amazing Adventures in the Life Of Nelvana. Bell Features & Publishing Co., no date. Redcoat Sailor: The Story of Sir Howard Douglas. Macmillan Co. of Canada, 1956. Redcoat Sailor: The Story of Sir Howard Douglas. Writ., R.S. Lambert. Macmillan Co. of Canada, 1956. Tecumtha. Writ., Wallace Havelock Robb. Abbey Dawn Press, 1958. Logging With Paul Bunyan. Ryerson Press, 1957. Logging With Paul Bunyan. Writ., John D. Robins. Ryerson Press, 1957. Front: Thrilling Stories For Boys. Bell Features & Publishing, no date. “Unfinished Business.” Writ., identified as Pat Hamilton but is most likely Pat Dingle. Thrilling Stories For Boys. Bell Features & Publishing, no date. 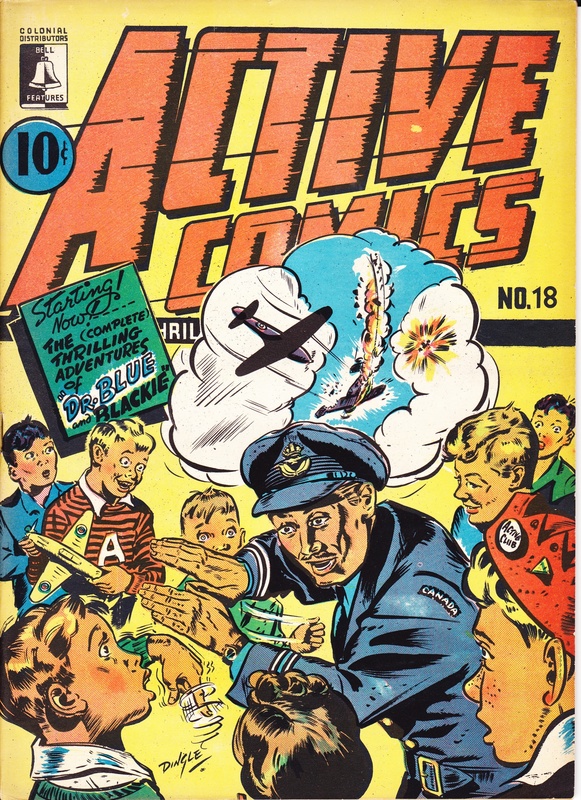 Front: Active Comics, no date. Front, Triumph Adventure Comics, 1-2, Sept. 1941. Front, Triumph Comics, no number, no date. Print. From internal evidence this is no. 7. Front, Triumph Comics, 12, no date. Front: WOW Comics, no date. Sergeant John Hannah, V.C.” Triumph Adventure Comics, 1-1, Aug.1941: 36. Winston Churchill.” Triumph Adventure Comics, 1-1, Aug.1941: 37. E.S. Fogarty Fegen, R.N.” Triumph Adventure Comics, 1-2, Sept. 1941.:31. A.G.L. McNaughton, Commander-in-Chief of Canadian Forces.” Triumph Adventure Comics, 1-2, Sept.
Capt. Douglas W. Cunnington.” Triumph Adventure Comics, 1-4, Nov.1941: 24. General Sir John Dill.” Triumph Adventure Comics, 1-4, Nov.1941: 38. Adventure Comics, 1-6, Feb. 1942: 22. John MacMillan Stevenson Patton.” Triumph Adventure Comics, 1-5, Jan.1942: 43. 1-1, Aug.1941: 40-49 1-2, Sept. 1941: 54-62.
of Fredericton, N.B.) Triumph Adventure Comics, 1-4, Nov.1941: 18-22. “Clue-Catchers.” Writ., Pat C. Triumph Adventure Comics, 1-5, Jan.1942:1-10. “Hi-jacking Davey Jones’ Locker.” Writ., Vic Griffin. Active Comics, 13, n.d. 36-40. 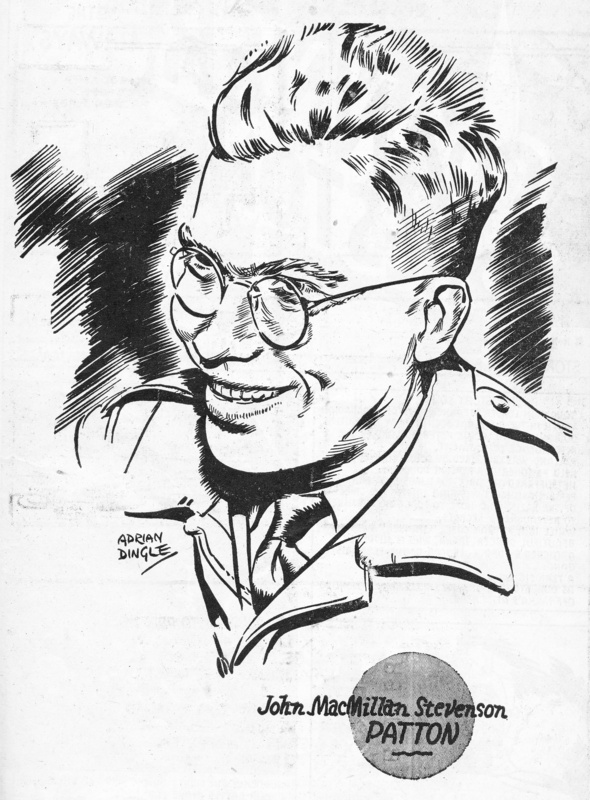 Front: Maclean’s, 15 Feb. 1945. CHARACTER??? —“ Active Comics, 10: 24-25, 46. “Active Jim’s Monthly Message.” Active Comics, 9: 18. “Active Jim’s Monthly News Letter.” Active Comics, 10:19. “Active Jim’s Monthly Message.” Active Comics, 11: 26. “Active Jim’s Monthly Message.” Active Comics, 12: 40. “Active Jim’s Monthly Message.” Writ., unidentified probably Adrian Dingle. Active Comics, 13: 16. “Active Jim’s Message.” Active Comics, no date. “Club News and Views.” Active Comics, 10:44-45. “Club News and Views.” Active Comics, 11:39-39. “Active Jim’s Club News and Views.” Active Comics,16: 16. Bell Features & Publishing Co.
“Adrian Dingle.” Nelvana of the Northern Lights. Car., Adrian Dingle. Ed., Hope Nicholson & Rachel Richey. Nelvana Comics, 2014. “Dingle Adrian (1912 – 1974).” Writ., Peter Harris. The World Encyclopedia of Comics. Ed., Maurice Horn. Chelsea House Publishers, 1976: 208. Guardians of the North: The National Superhero in Canadian Comic-Book Art. Writ., John Bell. National Archives of Canada, 1992. A catalogue for the exhibit of the same name. “An interview with Jerry Lazare.” Interviewer, Dave Sim,. Now and Then Times, 1-2, Oct. 1973: 33. “The Landscape: Adrian Dingle.” Canadian Notes & Queries, 93, Summer 2015. “World of Canadian Whites.” Writ., Bill Thomas. Now and Then Times,1-1, Summer 1972: 22. PENGUIN, [THE], SIGN OF FREEDOM, and other Bell Features characters. Adrian Dingle, Active Comics, 18: cover. One of the finest of the wartime comic covers. 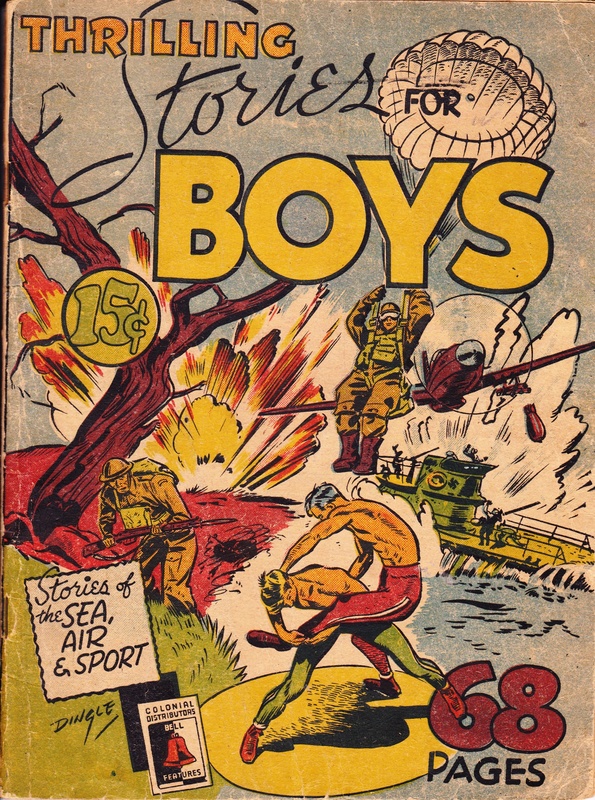 Thrilling Stories For Boys: Front cover. “Till Infinity, Portugal.” Oil on Masonite 22”X30”. 23rd Annual Sketches Exhibition, June 14 2017, Roberts Gallery, Toronto. This was a show & sale of historical Canadian art.